Physical map of the continent. Cities of Buenos Aires, Ushuaia (Patagonia Argentina) Caracas, Lima, Santiago. Atacama Desert, Andes. 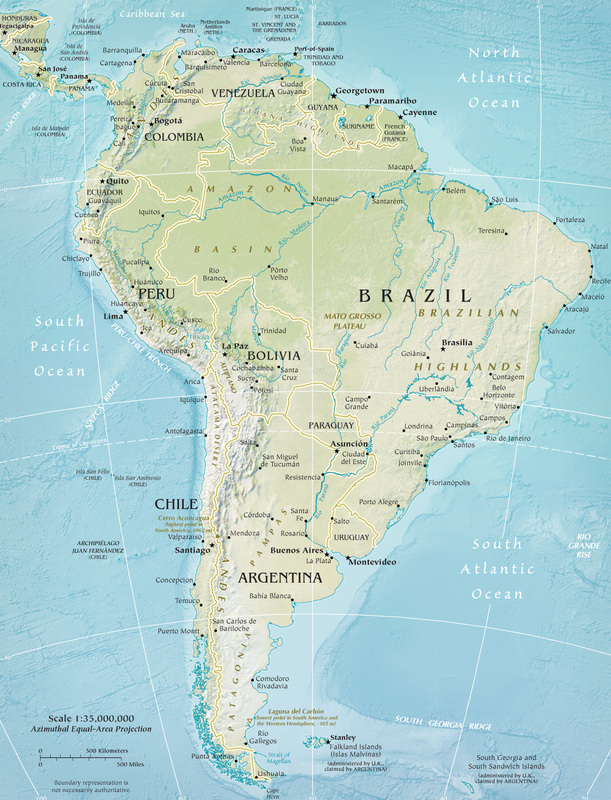 Guyana, Brazil, Chile, Colombia, Venezuela, Uruguay, Peru, Paraguay. Altiplano, Bolivia (NASA, October 1988). The high plateau region of western Bolivia and southern Peru, averaging about 3650 m above sea level, and its associated basin are bordered by the Cordillera Oriental to the east and the Cordillera Occidental to the west. 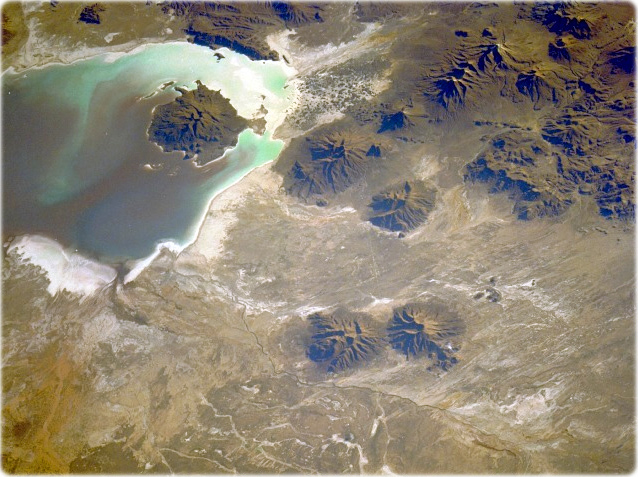 The details in this southwest-looking photograph are typical of the nonvegetated, generally flat, arid surface of the altiplano in southwestern Bolivia. The altiplano’s high, encircling mountain ranges, formidable physical barriers to weather systems, allow very limited quantities of precipitation during the summer months. The north-to-south drainage pattern shows flow into Lake Coipasa from the intermittently flowing Lauca River and its many tributaries. Along the western third of the photograph is a very pronounced volcanic landscape comprising individual volcanoes and clusters of volcanoes, which in terms of density and altitude are fairly typical of many areas of the Cordillera Occidental. The volcanic peaks range from 4900 m to more than 5800 m. Even though Lake Coipasa had water when this photograph was taken, it is frequently called Salar (dry lakebed) de Coipasa because of insufficient flow from the river. Evaporation is a major cause of water loss for the entire region.